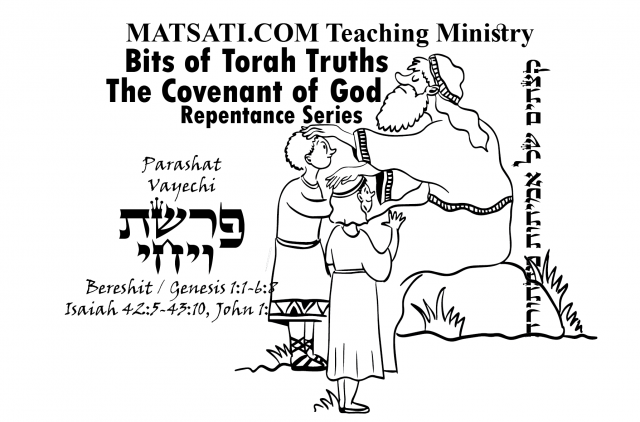 Bits of Torah Truths, Parashat Vayechi, פרשת ויגש, Walking with God an Activity for a Select Few? As we conclude the study on the first book from the Torah (Bereshit / Genesis) a question we may have is what does it mean to “walk with God?” In the Tanach, there are several people described as “walking with God,” beginning with Enoch according to Bereshit / Genesis 5:21-24, which states 5:21 Enoch lived sixty-five years, and became the father of Methuselah. 5:22 Then Enoch walked with God three hundred years after he became the father of Methuselah, and he had other sons and daughters. 5:23 So all the days of Enoch were three hundred and sixty-five years. 5:24 Enoch walked with God; and he was not, for God took him. (NASB) Based upon what the Scriptures say, Enoch walked with God and the Lord removed him from this world. This teaches us that we, the children of God are “in” the world, but we are not “of” the world. Noah also was described as “a righteous man, blameless among the people of his time, and he walked faithfully with God” (Bereshit / Genesis 6:9). The prophet Micah provides us with a glimpse into what the Lord desires for us saying, Micah 6:8 “He has told you, O man, what is good; And what does the Lord require of you But to do justice, to love kindness, And to walk humbly with your God?” (NASB) Do you think these descriptions of the men who “walked with God” is an activity reserved for a select few? The Lord God of Israel desires for all of His children to walk with Him. When the Torah speaks of “walking,” it often refers to a lifestyle which is in line with the ways of God as opposed to walking in the ways of the world (2 Kings 8:27, Ephesians 2:2, Colossians 3:7). If this is the case, why do the modern theologies today so vehemently teach against God’s Torah as a way of life for His people? In the Apostolic Writings, the phrase “walking with God” is often paralleled to “walking in the Spirit” (see Galatians 5:16 and Romans 8:4). To walk with the Lord God of Israel means that we choose to live our lives according to God’s Word to bring glory to His Name, regardless of personal cost. According to David in the psalms, walking with the Lord also means we do not walk with evil people as companions (see Tehillim / Psalm 1:1-3). This is what is understood as the narrow path we are set upon in seeking God’s kingdom, as opposed to the broad way which leads to destruction (Matthew 7:13-14, he way of the world). In other words, as God’s people, we choose to not live our lives to please our sinful desires (Romans 13:14). We seek first God’s kingdom and seek to eliminate everything that does not enhance our walk with Him (Hebrews 12:2). This is why Paul said what he did in 1 Corinthians 10:31 “So whether you eat or drink or whatever you do, do it all for the glory of God.” (NASB) As a result of these things, it is not difficult to identify the one who walks with the Lord, because God’s ways according to His word, are reflected in his thoughts, his actions, his motivations, and his life choices because such a person spends time with the Lord and in His Word. In this week’s Torah Portion, note how Jacob speaks of his fathers Abraham and Isaac walking before the Lord God of Israel. What is the significance of their having done this? Let’s reflect upon how we should be living our lives as we discuss this topic further. In this week’s Torah portion, we are looking at Bereshit / Genesis 48:10-22. Jacob states in Bereshit / Genesis 48:15-16, טו וַיְבָרֶךְ אֶת-יוֹסֵף וַיֹּאמַר הָאֱלֹהִים אֲשֶׁר הִתְהַלְּכוּ אֲבֹתַי לְפָנָיו אַבְרָהָם וְיִצְחָק הָאֱלֹהִים הָרֹעֶה אֹתִי מֵעוֹדִי עַד-הַיּוֹם הַזֶּה: טז הַמַּלְאָךְ הַגֹּאֵל אֹתִי מִכָּל-רָע יְבָרֵךְ אֶת-הַנְּעָרִים וְיִקָּרֵא בָהֶם שְׁמִי וְשֵׁם אֲבֹתַי אַבְרָהָם וְיִצְחָק וְיִדְגּוּ לָרֹב בְּקֶרֶב הָאָרֶץ: 48:15 He blessed Joseph, and said, ‘The God before whom my fathers Abraham and Isaac walked, The God who has been my shepherd all my life to this day, 48:16 The angel who has redeemed me from all evil, Bless the lads; And may my name live on in them, And the names of my fathers Abraham and Isaac; And may they grow into a multitude in the midst of the earth.’ (NASB) Note how Jacob opens his blessing saying הָאֱלֹהִים אֲשֶׁר הִתְהַלְּכוּ אֲבֹתַי לְפָנָיו which may be translated as “the God that they, my fathers, walked before Him” saying that the Lord is the One before whom he had walked. The Lord is his shepherd, his redeemer, and the One who saved him from all evil. With this said, Jacob declares that his name (Israel) will live on in the children, along with the names of his fathers Abraham and Isaac. This places an important emphasis upon his words in relation to living up to one’s name and family. Jacob was establishing the standard upon which his fathers had lived their lives, which is to live by faith and righteousness before the Lord. Sforno comments upon this in the following way. Sforno states that these verses are to be interpreted as being addressed to the Lord God of Israel and to his grandsons. He asks that they live their lives for the Lord for the sake of the merit of their fathers. Jacob is telling his children to live for the Lord for the name sake of their fathers and their family. This is a very important concept, because we are known by the family and the people we keep. Repeatedly in the Scriptures, we are instructed to live for His (God’s) name sake according to the Scriptures. For example, God guides us for His name’s sake (Tehillim / Psalms 23:3), He forgives our sins for His name sake (Tehillim / Psalm 25:11), He leads us for the sake of His name (Tehillim / Psalm 31:3), He delivers us from sin for His name’s sake (Tehillim / Psalm 79:9), He deals with us out of His goodness for His name’s sake (Tehillim / Psalm 109:21), and He lets us live for His name’s sake (Tehillim / Psalm 143:11). The point is, the Lord God does what He does for His sake and not ours. We exist as God’s people, alive and thriving in His kingdom, in order to embody his name. When the Lord acts for His name’s sake, He is acting in accordance with His character and to uphold the honor of His word, because of the glory that He has laid upon his people. This is why Jacob and the rabbis emphasize the importance of Jacob’s words calling upon his grandchildren to live for the Lord and for the sake of his name living on through them. אשר התהלכו אבותי לפניו, I have already explained on Genesis 17:1 that this wording includes serving G’d in one’s heart as well as with deeds. The root of all religious service is in the heart. [when it is only the from the lips outward it is a sham. Ed.] We must not understand Yaakov as claiming credit for himself or boasting, that he himself had served G’d, although it is a fact that he had served the Lord; he meant to give credit to his fathers, suggesting that if G’d had been at his side this had been largely due to the merits of both his father and grandfather. המלאך, having first spoken about G’d having assisted him, and creating the impression that G’d, personally, had done so, he now mentions the intermediary always used by G’d to do His work. We know from Psalms 34:8 חונה מלאך ה’ סביב ליראיו ויחלצם, “G’d’s angel camps around those who fear Him and He rescues them,” that His agents called מלאכים are close at hand whenever the righteous are in danger. This is why Yaakov at this time referred to המלאך הגואל אותי מכל רע, the one sent by G’d to rescue him, protect him, and bless him, יברך את הנערים will function similarly and protect Joseph’s sons. We know that such angels had been in evidence protecting Yaakov first from Lavan, then from Esau, and again when the Emorites launched an attack after Yaakov’s sons had killed the males of Shechem and looted the town. Note how Radak connects serving the Lord being accomplished in the heart which is connected to our deeds. To only give the Lord “lip service” from the heart is what he calls a “sham” (noun: a thing that is not what it is purported to be, adjective: bogus; false). In addition to this, notice how Radak says “We must not understand Yaakov as claiming credit for himself or boasting” he explains that the credit goes to both the Lord God in heaven, and to his intermediary (המלאך, angel, messenger). Radak concludes saying, “This is why Yaakov at this time referred to המלאך הגואל אותי מכל רע, the one sent by G’d to rescue him, protect him, and bless him, יברך את הנערים will function similarly and protect Joseph’s sons.” How significant is this interpretation in relation to Yeshua the Messiah, the one sent of God to save His people? Akeidat Yitzchak connects Noah to being motivated to walk with God, and having been so motivated, he walked before the Lord as a righteous man. This speaks of men who took it upon themselves to prepare their hearts to seek the Lord. The Scriptures provides us with much precedent on the need for man to prepare his heart before the Lord to seek the God of Israel all the days of his life. Midrash Tehillim 108, Part 1 states saying, “Scripture also says, Then the priests, the Levites, arose and blessed the people; and their voice was heard of the Lord, and their prayer came up to His holy habitation, even unto heaven (2 Chronicles 30:27). David said, Accordingly, behold, I will prepare my heart so that the Holy One blessed be He, will hear my prayer. Hence it is said, My heart is prepared, O God; I will sing, yes, I will sing praises (Tehillim / Psalms 108:2).” This illustrates for us the importance of preparing our hearts daily. In 2 Chronicles 12:14, we read “And he did evil, because he prepared not his heart to seek the LORD” (וַיַּעַשׂ הָרָע כִּי לֹא הֵכִין לִבֹּו לִדְרֹושׁ אֶת־יְהוָֽה׃). The Tanach states directly that Reheboam did evil because he did not prepare his heart to seek the Lord. If you think about it, relatively few people set out determined to do evil. They don’t wake up in the morning asking themselves saying, “today how can I transgress God’s commands to do evil?” Instead, sin is more subtle than that, a person falls into sin because he or she has not prepared his or her heart to seek the Lord. This passage in 2 Chronicles 12:14 speaks of Rehoboam, the king of Israel, who was the grandson of David. He inherited the throne when he was 41 years old, at the death of his father Solomon. In the beginning of his reign, his heart was sensitive to the Lord because we are told that he listened to the Lord at the word of a prophet from God according to 2 Chronicles 11:1-4. Studying the history of Israel, we learn that Rehoboam’s seeking the Lord God of his fathers only lasted for three of the 17 years of his reign (2 Chronicles 11:17). Does this sound familiar? It certainly does to me. During the time I have been alive, I have known a few people who genuinely loved the Lord at one time and were excited about the things of God, yet they grew cold and, in many cases, completely abandoned the Lord and the things that were once so important to them. How can this be? Could this be because they did not daily prepare their hearts to seek the Lord? The word “prepare” means “to make (something) ready for use or consideration” (synonyms: make/get ready, put together, draw up, produce, arrange, assemble, construct, compose, formulate). Notice the definition to prepare means to make something ready for use. When we prepare our hearts, we are making our hearts ready for the Lord to use. This phrase “to prepare our hearts” conveys the idea of a deliberate effort over a prolonged period of time. The Hebrew word that was translated “prepare” in 2 Chronicles 12:14 is הֵכִין is from the root word כון meaning “to be firm, be stable, be established, to fix.” The preparation of our hearts is to fix it upon one thing, to seek the Lord God of Israel and His kingdom. Know, my child, that any commandment that God requires of humankind comes only out of God’s desire to benefit us… God’s command to build the Tabernacle, for us to offer therein our prayers and sacrifices, comes not out of God’s needs to dwell in an earthly dwelling among humankind, but rather [out of God’s awareness that we need] train our own selves. …Each one of us needs to build God a Tabernacle in the recesses of our hearts, by preparing oneself to become a Sanctuary for God and a place for the dwelling of God’s glory. 1 John 1:1-10, So what are we supposed to do?